How to make an image trigger an audio file to play? Flip ShoppingBook Maker has a feature that enables you to embed image on flip pages. It might not be your terminal purpose. We should like it to do action such as play music. The embedded image will react the mouse moving and clicking. When you click down, it will play beautiful music. 1 Start Flip ShoppingBook Maker, click on the button of Edit Shopping Cart. 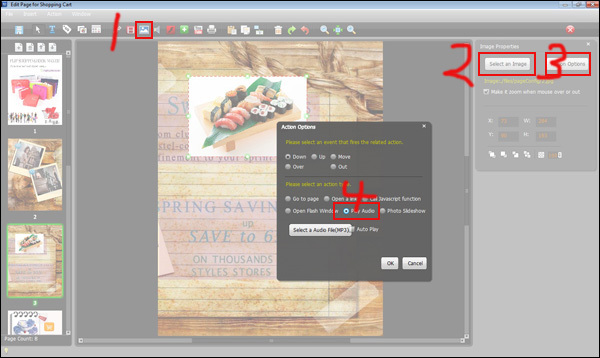 2 Click the icon of Add image, load in an image and then click on Action Options. 3 Click on Play Audio on the edit window popped up.